With mobile use growing rapidly around the world here is a quick insight into the growth it is seeing. 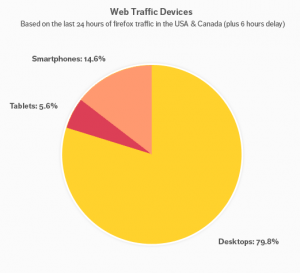 In North America 20% of total internet use is mobile, smart phone and tablet traffic, smartphones and tablets make up 14.6% and and 5.6% of traffic respectively. This is not a surprise as smartphones and tablets have outshipped notebooks and desktops since Q4 2010. What is interesting is that even though 59% of smartphones shipped were Android devices (compared to 23% for iPhone), iPhone users make up 74% of smartphone traffic. Compare this to the tablet traffic and Apple’s dominance becomes even clearer, the iPad makes up a shocking 95% of tablet traffic. Another anomaly to consider is that mobile traffic makes up 40% of internet use in China. Baidu, China’s equivalent to Google, has released stats from the first quarter of 2012 that show mobile browsing makes up 40% of traffic in 5 major Chinese provinces. This is especially interesting when considering the contrast between Chinese and North American traffic. While iPhone and Android devices dominate North American mobile browsing, they make up a mere 5.8% and 14.4% of mobile browsing in China. This is because in China mobile browsing is led by older 2G phones, totalling 85% of browsing, and the fake phone market makes up a surprisingly high 16%. So why is this important? Well, the first thing you should know when starting to design your mobile site is what devices your audience are using. It is important to therefore design and build your site to operate effectively across both these operating systems, by understanding the use of your site you can make sure your website is optimised to take advantage of mobile web growth.